A recently published article in Environmental Toxicology and Chemistry, "Effects of Micronized and Nano-Copper Azole on Marine Benthic Communities" explores the risks to the smallest creatures in aquatic communities posed by increased use of the anti-fouling wood treatment. Copper salts have a long history of use as a wood preservative. Recently, copper nanoparticles are being mixed in formulation with anti-fungal azoles, finding their way into fungicides, algaecides, and important to this research, into paints used to protect boats and other submerged surfaces, where they do leach off the surface and into the waterways. Little is known about the ecological effects of this combination on aquatic life. 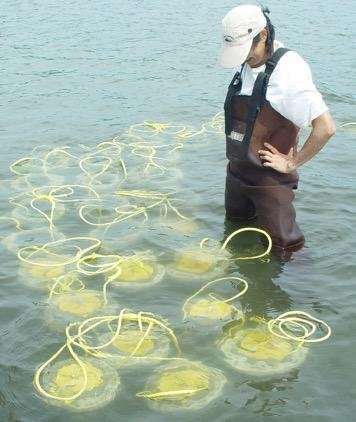 Author Kay Ho and her colleagues used a unique method combining in-field and laboratory practices to assess the effects of micronized copper azole (MCA) on estuarine benthic communities. The findings indicate that MCA represents a source of harm to marine benthic communities comparable to that from copper salts, such as copper sulfate. The authors note that there is a need for "better understanding of benthic community interactions when exposed to nanomaterial stress." Chemical processes use more copper nanoparticles than stars in the sky – but what is their optimal size?